Despite the likelihood that the Republican sweep in last year's midterm elections will bring ever more legislated hostility toward reproductive rights, 2015 might not be so bad for abortion access. Or, at least, 2015 might not be as bad as the past four years when it comes to laws that restrict women's ability to access reproductive healthcare, according to new tallies from the Guttmacher Institute. But let's not be too hopeful. 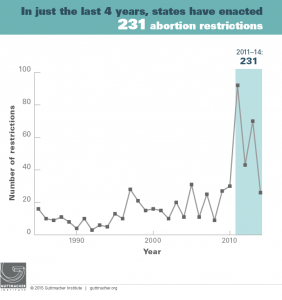 A recent report from the reproductive rights research group finds that in the time since the 2010 midterm elections, states have adopted well over 200 abortion restrictions -- 231, to be precise -- out of 335 proposed provisions. In comparison, just 95 measures to expand or protect abortion access were introduced in the same time period; while that's the most positive measures for two decades, it still hardly compares to the rising number of restrictions on access. In 2014 alone, lawmakers in 15 states enacted 26 new abortion restrictions -- and the state legislatures in places such as Texas and North Dakota weren't even in session. Guttmacher also notes that the number of states considered "hostile" or "extremely hostile" to abortion rights has also skyrocketed, as well as the proportion of women living in hostile states. In 2000, just 31 percent of American women lived in states that were considered to be hostile -- places with four or five restrictions on abortion -- and none lived in states that were extremely hostile -- states with six or more restrictions. By the end of last year, 57 percent of women lived in states that were either hostile or extremely hostile. The entire South is now considered to be, at the very least, a hostile place for abortion rights. While there does appear to be some good news (there was, after all, a decline in the number of restrictions enacted in 2014), overall the report is foreboding. GOP control over statehouses, governors' mansions and Congress promises to bring renewed challenges to reproductive healthcare, likely in the form of increased TRAP laws meant to curb abortion access. Just last month, Sen. Mitch McConnell expressed his support for a renewed push to pass a federal 20-week abortion ban, which has previously popped up in several states.